Kung Fu Panda 2 is 91 mins of Hiii-yaa-ing, Po Style, while he tries to beat the creepy villain and find his identity. It might not be a new treat, but it’s like rediscovering your favorite dessert from 2008. It’s as goofy, entertaining, and gripping as the first installment, and even though it doesn’t stand out as its own – you have enough going for the film in the laughs and moral department. Ideal watch for kids, but an equal entertainer for adults! In a Shakespearean comedy, the pudgy, underdog klutz would usually be the character description of the hero’s sidekick – but with the Kung Fu Panda Series, Jack Black as Po, the Panda, redefines the term “hero”. If the first film made us believe with strong doses of faith, that anybody could be a hero and accomplish the un-accomplishable, Kung Fu Panda 2 does a fine job of showing us how it is to live up to the reputation. This time around, the introductions are done. We are well versed with the characters, Po the endearingly overweight Panda, the Furious Five - Tigress (Angelina Jolie), Monkey (Jackie Chan) Mantis (Seth Rogen), Viper (Lucy Liu) and Crane (David Cross), their inter-personal relationships and how the uncanny situation of a Panda being the Dragon Warrior came about to be. While the first movie was about Po’s training and redemption, this time around Po’s nemesis Lord Shen (Gary Oldman) is sly and sinister, as opposed to the magnanimously dangerous Tai Lung of the first movie. We see Po venture into his past, to seek his identity while trying to destroy the enemy of the country. Po’s victory becomes sweeter for the audience because it’s that much more satisfying to beat a creepy villain. We know how it's going to end, but Po's clumsy idiosyncrasies pull you through a laughter-ridden hour and a half, as Po proves himself to be an entertaining yet worthy Dragon Warrior. A must-mention is the intricate 3D animation – even as a layman you can tell the details are remarkable and as imaginative as it gets. The expressions and voiceovers blend almost perfectly while absorbing you into their world of honour, colour and humour. Although the sequel allows Po to be a savior, and a convincing one at that – this time around his goofy instances are cut short and much time is devoted to funny dialogues. He’s still the same old Dumpling-loving, bouncy Panda. What I love is that the success has not gotten to his head, but the sense of him being an underdog has considerably reduced. This makes the plot slightly predictable, as Po has the same eureka moments as the first installment; the humour is on the same level with just a shift in the story. However, the ultimate moral self-belief and hidden power manifests into 90 minutes well spent. It’s undoubtedly charming and funny, just not funnier and more charming than the first movie. You could watch both movies back to back and think of it as one long film. That stands as a victory for Kung Fu Panda 2, in a world where sequels and 3D movies are clouding pretty much every aspect of a film. If you are confused about whether to go watch the film, don’t be. 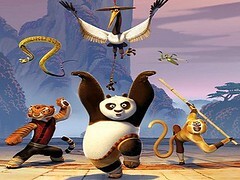 You will have fun; you will remember why you loved Kung Fu Panda and you will find the idea of a sequel seems exciting. Even so, Baby Po is so adorably animated in Po’s flashback, you’ll want to freeze the frame and just cuddle him to sleep. Baby Po is adorable, bouncy, funny and his eyes speak of an upcoming legend. Much like the film. leto5 has given this movie a Yay! Thumbs Up(amazing). leto5 has posted 4 comments and has rated 3 movies. See leto5's page for more details.